iPhone and iPod touch users who are using Windows Live Messenger, previously known as MSN Messenger which is also the world’s largest instant-messaging network, no longer has to rely to third-party or unofficial app to get connected to friends, family members, relatives, colleagues and buddies on Windows Live Messenger. 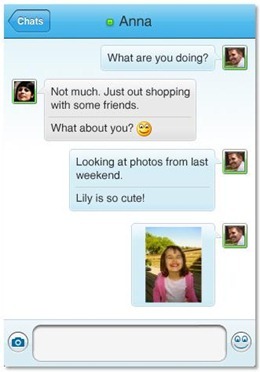 Microsoft has released the official Windows Live Messenger app for iPhone and iPod touch. Windows Live Messenger for iPhone and iPod Touch features most of the capabilities and functions of desktop-based Windows Live Messenger client, including send and receive instant messages, concurrent chat support with push notification when the app is closed, ability to view or set photos, links, and other rich content as status message, notification when new emails arrived in Hotmail inbox, connect to other social networks such as Windows Live, Facebook, Flickr, Youtube and MySpace, ability to check emails from mobile web version of Hotmail from within the app, and etc. Chat: Instant message with your Windows Live Messenger and Y! Messenger contacts on the go so you’re always connected to the people that matter most. You can even receive IM notifications when your app is closed so you never miss a message. 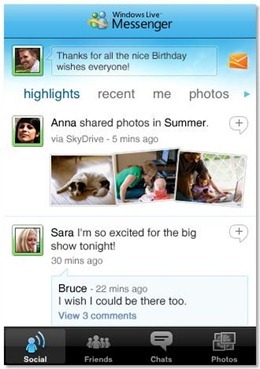 Social: Windows Live Messenger gives you one place to view the updates your Messenger friends are sharing from social networks like Facebook, Flickr, MySpace and more, helping you cut through the clutter on the go. Photos: Upload photos right from your phone to share your favorite moments with the people that matter most. Create albums, add captions, and let your friends and family comment on your photos. Hotmail: Access your Hotmail account without leaving the app to read, reply to, and compose emails. Get email notifications within the application so you know when you have new messages. Windows Live Messenger for iPhone and iPod Touch is free, works on all versions of iPhone OS, including the iOS 4, and is designed to complement the upcoming Windows Live Essentials Wave 4 with Windows Live Messenger 2010 (or some said Windows Live Messenger 2011) v15. Beta version of Windows Live Essentials Wave 4 is now available. Download Windows Live Messenger for iPhone and iPod Touch from the iPhone App Store.